all via Kate Spade NY. Oh, and don't forget to read the belonging guide for a cocktail night with the ladies! What kind of parties do you like best? Have you planned anything for New Year's Eve yet? this is my favorite Kate Spade line thus far! i didnt know this brand! amazing items! I totally love the flats, the watch and the dress! Gorgeous items. I adore Kate Spade and her amazing collections! This one is so sweet and magical! The champagne theme is so sweet and so are those cute flats. My favorite piece is one I do not see here. It is a champange bottle shaped coin purse. I really need it! those shoes. That candle. That phone case. Oh my goodness looks amazing I need all of it. I love the color of Kate Spade so much, so sweet and pretty! 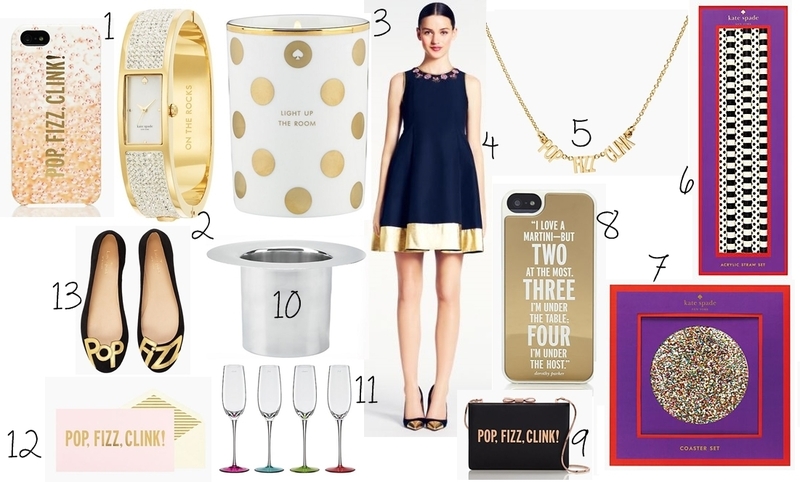 No 2, 9 and 13 are going to the top of my Kate Spade wishlist, sooo adorable! P.S I completely agree with you on cartoon sweaters. It was really great hearing your opinion on my last post. Everything is so beautiful! I would like hours! Love the candle! We haven't made plans yet for New Year - I suppose we should get organised!